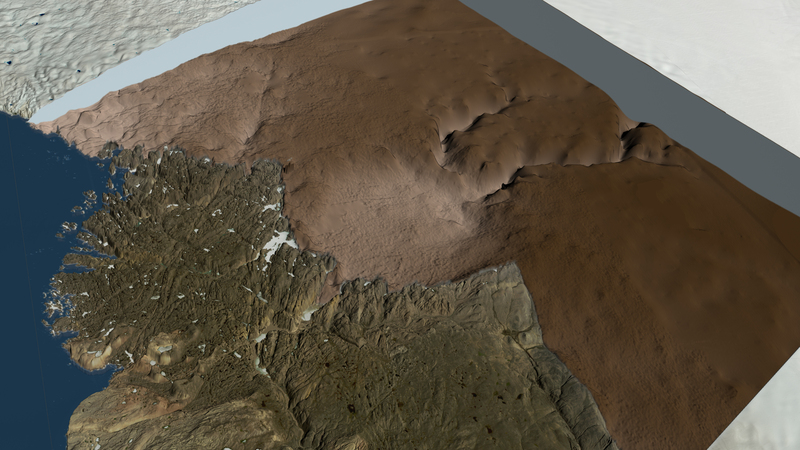 An international team of researchers discovered a large meteorite impact crater hiding beneath the ice of northwest Greenland. The crater—the first found under the Greenland ice sheet—is one of the 25 largest impact craters on Earth, measuring roughly 300 meters (1,000 feet) deep and more than 30 kilometers (19 miles) in diameter. 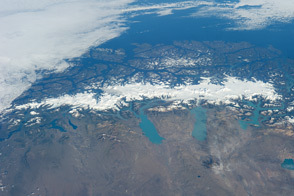 The group, led by researchers from the University of Copenhagen’s Centre for GeoGenetics, worked for three years to verify their discovery, which they initially made in 2015 using NASA data. Their finding was published in November 2018 in the journal Science Advances . 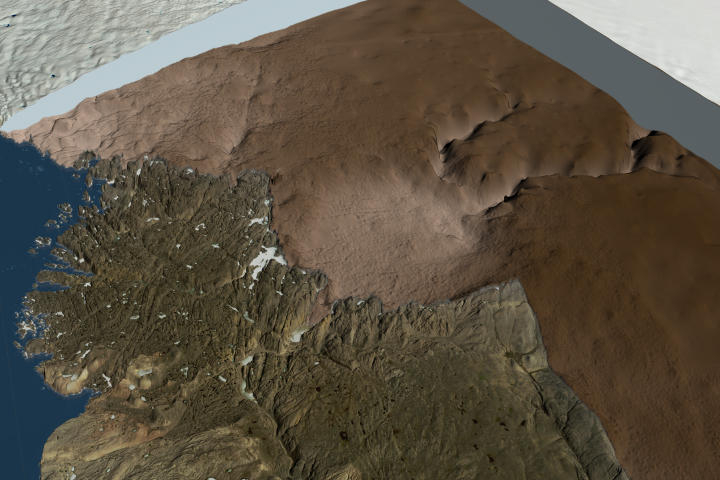 The images on this page are data visualizations showing the shape of the landscape around and beneath Hiawatha Glacier. “The crater is exceptionally well-preserved, and that is surprising because glacier ice is an incredibly efficient erosive agent that would have quickly removed traces of the impact,” said Kurt Kjær, a professor at the Center for GeoGenetics and lead author of the study. 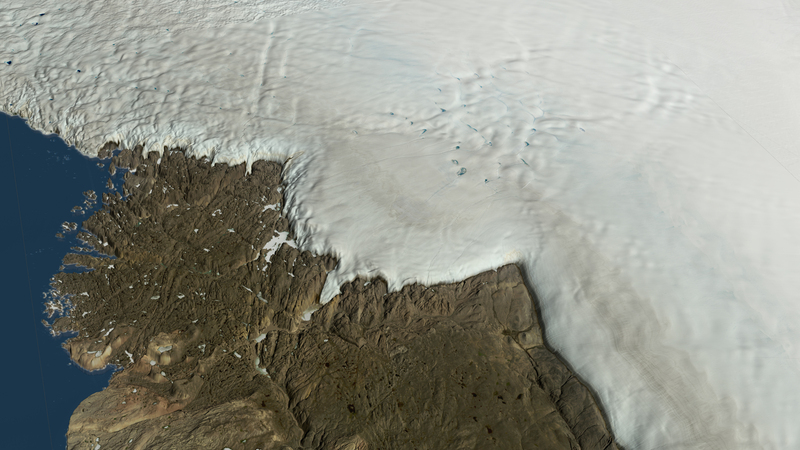 The researchers first spotted hints of the crater in July 2015 while inspecting a new map of the topography beneath Greenland’s ice sheet. 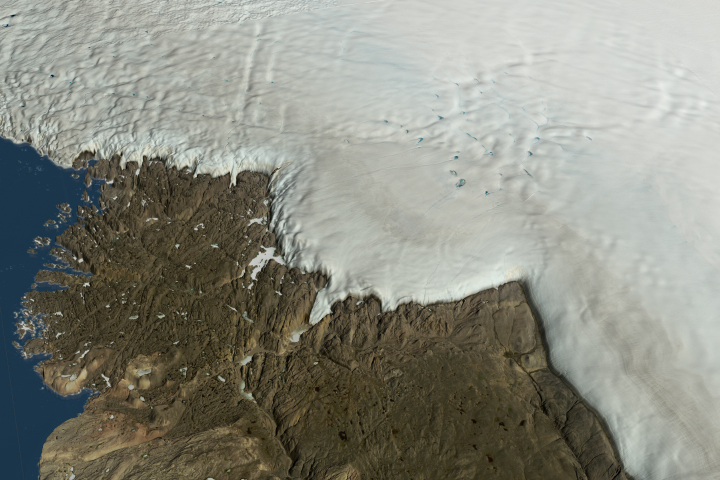 The map was largely based on ice-penetrating radar data from NASA’s Operation IceBridge and other airborne missions in Greenland. 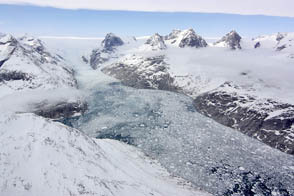 The scientists noticed an enormous, previously unexamined depression under Hiawatha Glacier, which sits at the edge of the ice sheet in northwestern Greenland. 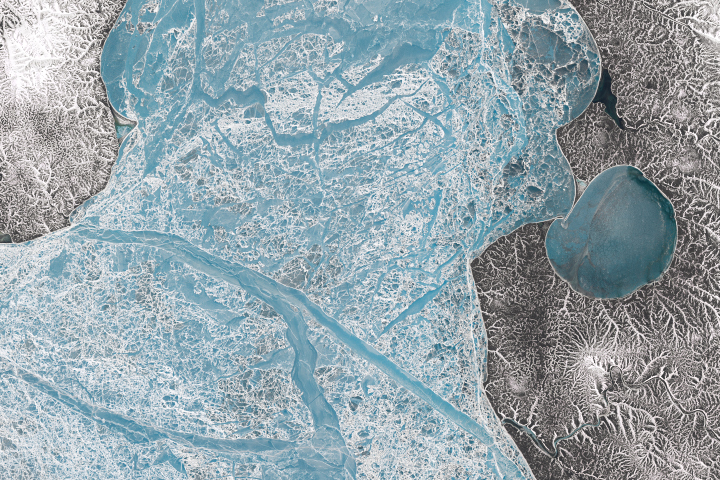 Reviewing imagery of the Hiawatha Glacier region as observed by the Terra and Aqua satellites, NASA glaciologist Joe MacGregor also found evidence of a circular pattern on the ice surface that matched the one in the bed topography map. The researchers believe the crater formed less than 3 million years ago when an iron meteorite—more than half a mile wide—smashed into northwest Greenland. The resulting depression was subsequently covered by ice. 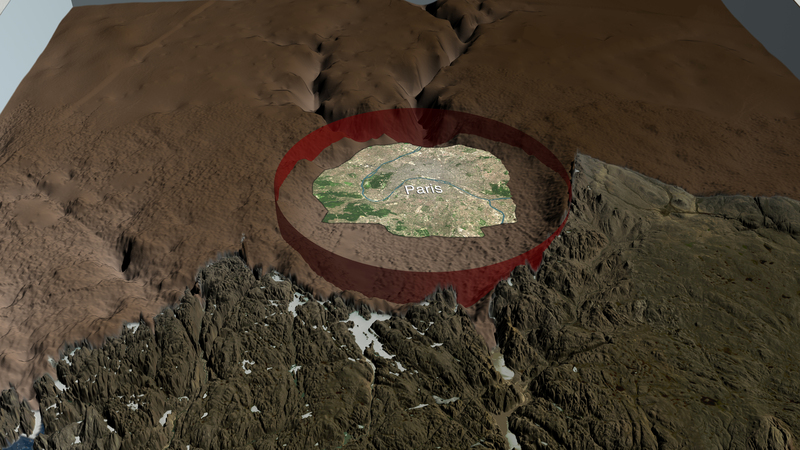 Kjær said that the crater’s condition indicates that the impact might have occurred toward the end of the last ice age, which would place the resulting crater among the youngest on the planet. Images by Cindy Starr, using Landsat data from the U.S. Geological Survey, MODIS data from NASA EOSDIS/LANCE and GIBS/Worldview, Blue Marble data courtesy of Reto Stockli (NASA/GSFC), Mathieu Morlighem (UCI), Government of Canada; Natural Resources Canada; Earth Sciences Sector; Canada Centre for Mapping and Earth Observation and AMSR2 data courtesy of the Japan Aerospace Exploration Agency (JAXA). 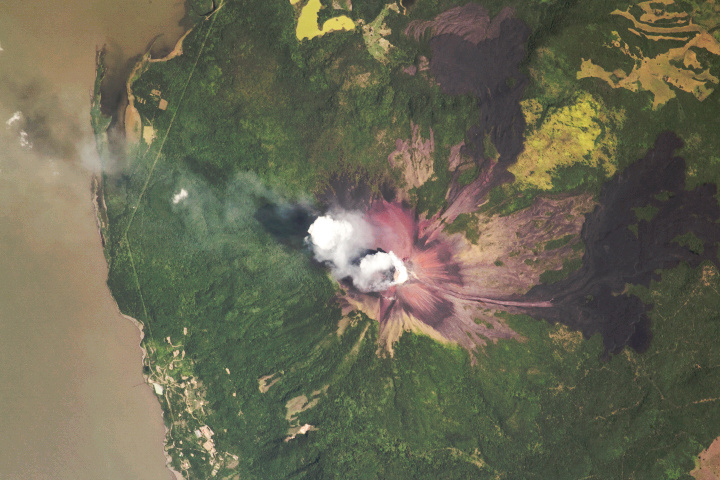 Story by Maria-Jose Viñas-Garcia, NASA Earth Science News Team. 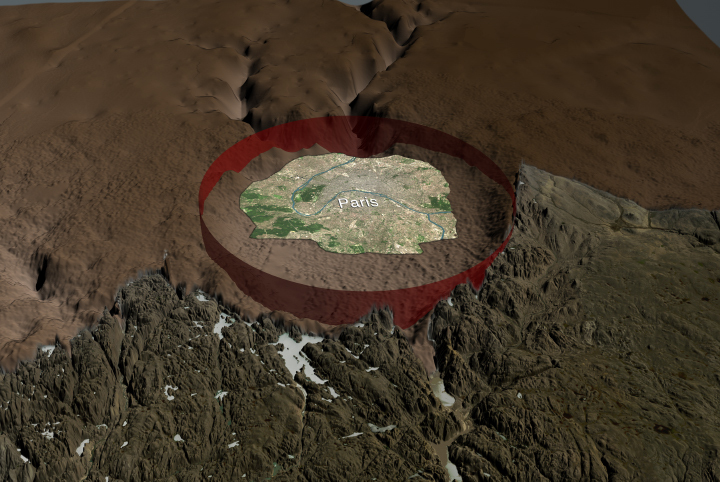 The Hiawatha Impact Crater in northwest Greenland was detected through some creative detective work and innovative instruments that can see through the ice.